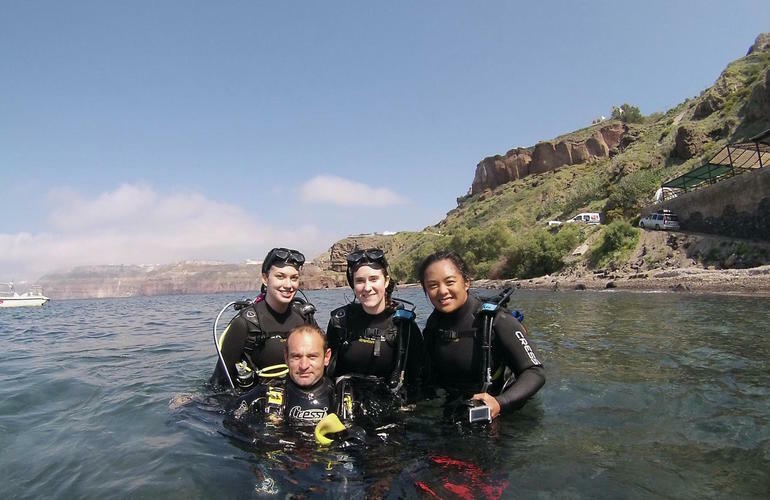 Try a new adventure while in Santorini and dive with the experts of Santorini Diving Center to explore the unique underwater world of the island. 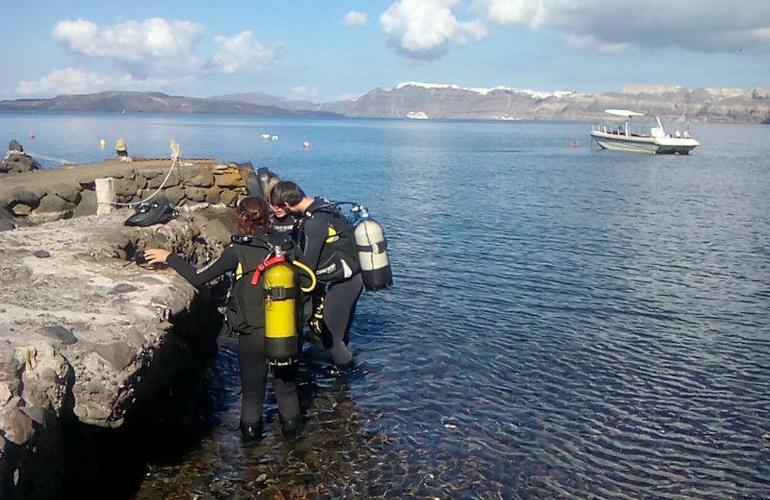 Accompanied by a professional Dive master or Instructor you will have the chance to try scuba diving for the first time in safety, while exploring the sea bottom of Santorini. A fun and safe activity that should be on your bucket list! 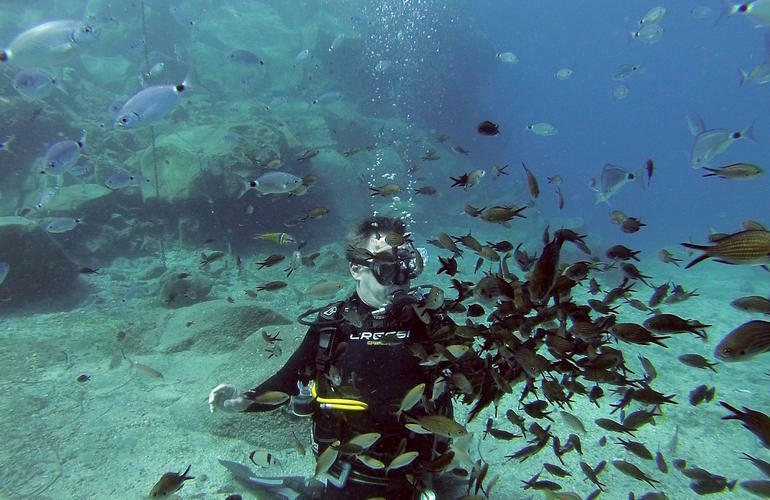 You do not need to be athletic to try scuba diving. 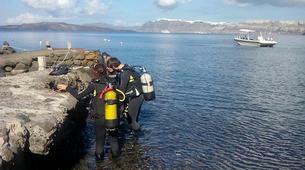 Anyone can do it thanks to the Discover Scuba Diving programme. 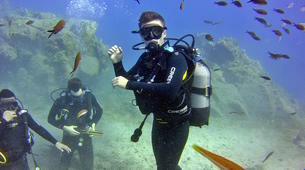 It's an introductory scuba diving lesson guided by an experienced and certified instructor. 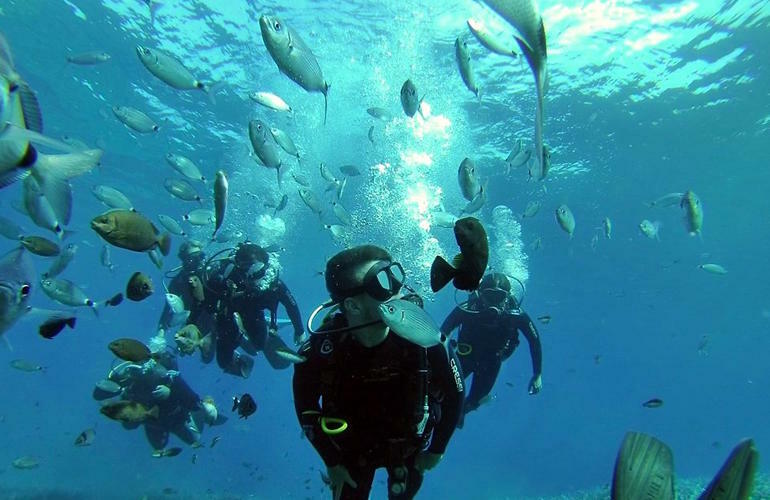 With this course you will learn how to use the scuba gear, and how to "breathe" underwater while scuba diving. 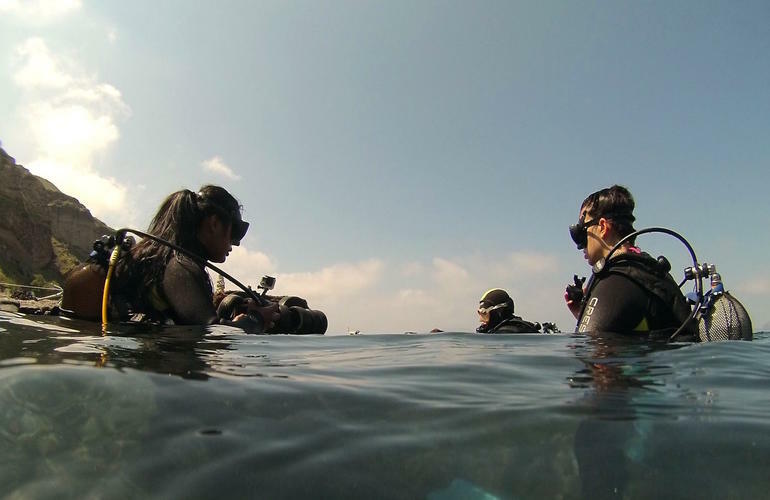 It's an easy introductory course that will help you step in the scuba diving world. 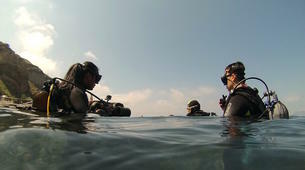 Over 2 hours you will learn in shallow water how to use the scuba gear, and how to dive. 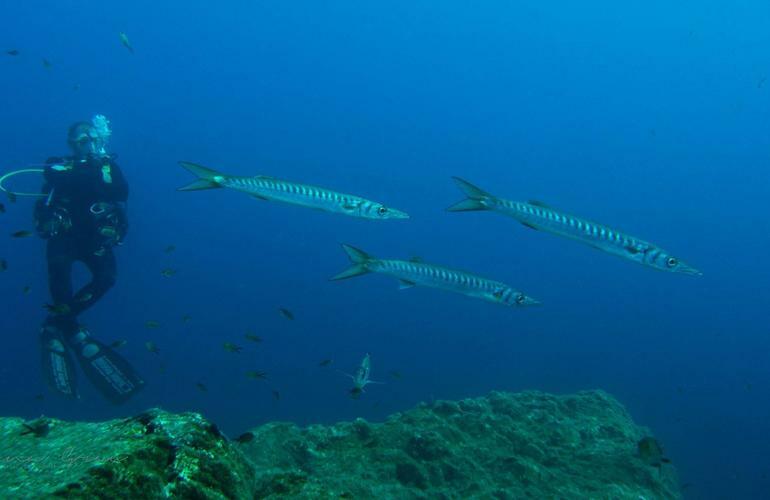 The first dive takes place in a rocky reef where fascinating marine creatures can be found. 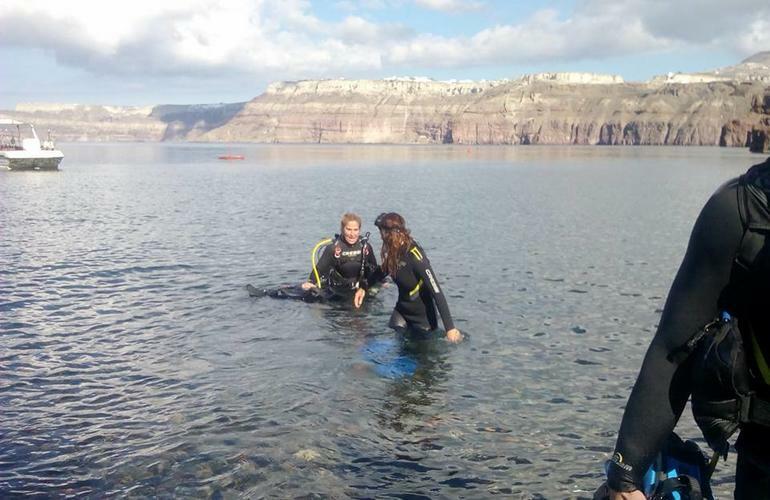 An additional dive in open water around Caldera and Volcano can be provided if you want to explore the underwater sea bed of Santorini! 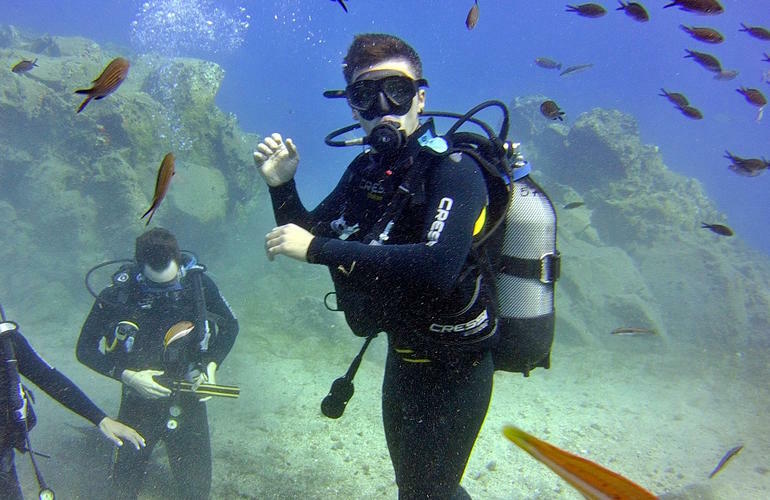 The Discover Scuba Program starts from the dive station on the beach, where one of the qualified instructors will teach you basic scuba principles, the important underwater hand signals and how to use the equipment. This briefing takes about 20 minutes, and then you will get into wetsuits and equipment, and walk into the water right off the beach. 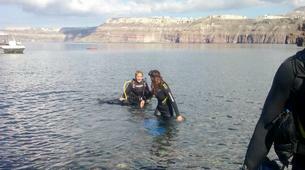 You will stop in shallow water (about waist deep) and bend down to take your first breaths underwater! 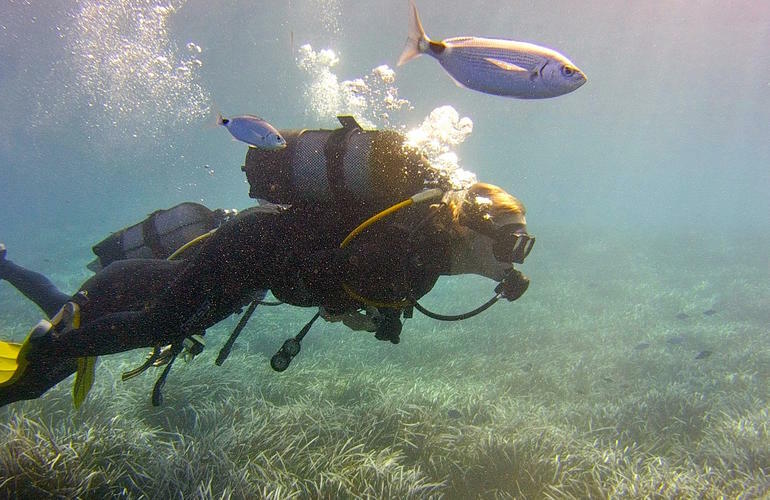 Once you're comfortable with breathing using the scuba equipment you will go with the instructor underwater for a guided dive to the nearby reef and you will have the chance to hand feed the fish. 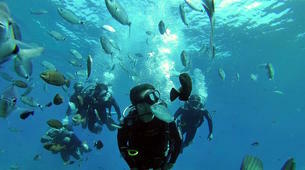 You will be underwater approx 35-40 minutes in total. Total duration 2 hours. There is a free pick-up from/to from most places around the island. Contact your instructor before to arrange your transportation. Message from the Pro: "Note that from Oia, we only do pick up at 9:30 in the morning, not pick up available for noon dives. And after the dives on the way back because of the traffic, we are short in time with the transfers, we can to drive you till the bus station in Fira and take a bus or a taxi back to Oia (about 20 min). If you like to continue sightseeing after the dives, we will be happy to drive you also to the famous red beach, excavation of prehistoric village 5 min away from the station or at the black sandy beach in Perissa 15 min away and any time you like you can get a bus or taxi back to Oia." 2. Height, weight and shoe size of all of you so we can arrange your equipment. 3. Name of the Hotel, location of your accommodation or contact tel. number to arrange the pickup at the nearest meeting point. 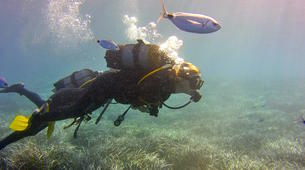 Please note you are not allowed to fly for up to 12 hours after your last dive. From the moment we were picked until the second we got dropped off it felt down to earth, caring and the dive was an amazing experience. Très bonne activité, moniteur très gentil. Une superbe activité, ça vaut le coup. Activité très bien encadrée, le moniteur a très bien expliqué les consignes. Superbe activité avec des instructeurs géniaux !! Ça vaut vraiment le coup !! Activité très bien encadrée et un cadre idyllique pour une première plongée. 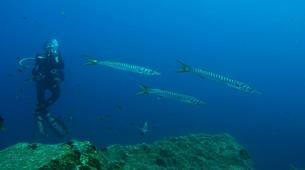 La plongée s'effectue à proximité du port, nous descendons à environ 7m de profondeur. L’une des meilleures expériences de ma vie! Je n’avais jamais testé la plongée et je recommande à tout le monde d’essayer !! L'activité s'est déroulée à la perfection. Pour moi, c'était une première et la monitrice à su s'adapter pour expliquer les choses simplement et efficacement. Elle s'est montrée gentille et professionnelle pour m'aider à bien apprivoiser la plongée. Super bien expliqué super bien encadré et matériels de très bonnes qualités! Pour clôturer le tout les poissons étaient au rdv !!! Très bonne activité, les moniteurs étaient très gentils et professionnels. Je recommande ! It was an amazing experience. Definitely recommended. 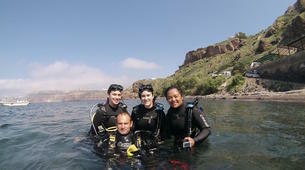 Beginners course: they take you step by step through safety, equipment, and procedures. 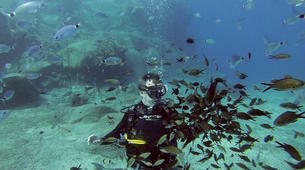 The activity was amazing, definitely a must for your list of activities in the island!